Khatia's extraordinary talent was recognized when she was very young. Aged six, she gave her début performance as soloist with an orchestra, and was subsequently invited to give guest performances in Switzerland, the Netherlands, France, Germany, Belgium, Italy, Austria, Russia, Israel and the USA. Khatia prefers not to be regarded as a child prodigy: virtuosity for its own sake does not appeal to her. Above all, she embraces pianists from earlier generations such as Rachmaninoff, Richter and Gould. She admires her "favourite pianist", Martha Argerich, for her uniqueness and, as a consequence, does not view Argerich as someone she should try to emulate. And since she regards herself as "wholly a person of the 20th century", Khatia does not identify so much with pianists of today. Khatia's warm, sometimes sorrowful playing may reflect a close proximity to Georgian folk-music, which, she attests, has greatly influenced her musicality. Critics emphasize that her playing has an aura of elegant solitude and even melancholy, which she does not feel to be a negative attribute. "The piano is the blackest instrument," she says, a "symbol of musical solitude", which even a pianist must become accustomed to. "I have to be psychologically strong and forget the hall if I want to share it with the audience." During her studies at Tbilisi's State Conservatoire, Khatia won a special prize at the Horowitz International Competition for Young Pianists in Kiev in 2003 as well as first prize at the Foundation to Assist Young Georgian Musicians competition set up by Elisabeth Leonskaya. At the 2003 Piano Competition in Tbilisi, she became acquainted with Oleg Maisenberg, who persuaded her to transfer to Vienna's University of Music and Performing Arts. Winner of the Bronze Medal at the 12th Arthur Rubinstein Piano Master Competition in 2008, she was also distinguished as the Best Performer of a Chopin piece and as Audience Favourite. A BBC Radio 3 New Generation Artist for 2009-2011, Khatia regularly collaborates with BBC orchestras. In 2010 she receiveda Borletti-Buitoni Trust Award and has been nominated by Vienna's Musikverein and Konzerthaus as a Rising Star for the 2011/2012 season. Khatia Buniatishvili speaks five languages fluently and lives in Paris. The extremely gifted young Georgian pianist Khatia Buniatishvili is devoting her debut album on Sony Classical to Franz Liszt in celebration of the composer's 200th birthday this fall. Although Buniatishvili sees herself as belonging truly to the 21st century, like the Romantics she looks for greatness in small things and for the universal in the individual. In the music of Liszt, she seeks and finds her idea of musical completeness and pianistic perfection, saying that "only he would enable me to present as a unity the many aspects of my soul." We all need caressing. This is why I rate the professional prospects of Khatia Buniatishvili rather high. On Thursday night the 27-year-old Georgian played Chopin's Piano Concerto No. 2 in a manner that turned Roy Thomson Hall into a flower-laden sitting room and all the listeners (and there were plenty at this Toronto Symphony Orchestra subscription concert) into intimate friends. Even the entry of the piano in the first movement, marked fortissimo in the score, came out as a less-is-more mezzo-piano. The Larghetto was a wonder of moonlit romance, the tempos free and the filigree exquisite. A quick tempo in the finale did not prevent the scherzando sequence from having a patrician lift. As if to demonstrate that she has extrovert chops, Buniatishvili played the manic finale of Prokofiev's Piano Sonata No. 7 as an encore. The rhythm had a jumpy quality that was true to the marking: precipitato. Of course Buniatishvili's elegant stage deportment and dark good looks had no effect whatever on the impression she made. That would be irony. READ THE FULL National Post REVIEW. 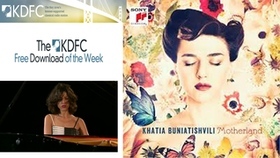 Each week KDFC - San Francisco members can download a free mp3 from some of the biggest releases in the world of Classical music, only at KDFC.com Following the success of her Chopin album on Sony Classical, Khatia Buniatishvili now reveals a new, highly personal side on her album ‘Motherland'. The CD is an intimate quest encompassing solo piano works from Bach to Pärt and from Brahms to Kancheli, in which the themes of longing for home, the merriment of a folk dance and the eternal cycle of growth and decay are apparent. 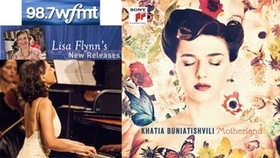 Spanning a broad stylistic and historical range, the album celebrates the works that have accompanied Khatia Buniatschvili's personal path in life, including pieces from her Georgian homeland. 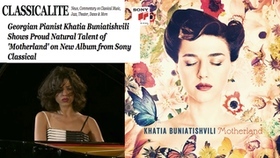 Download a free mp3 of Buniatishvili performing Ravel's "Pavane Pour Une Infante Defunte"
Khatia Buniatishvili has been described by The Independent as "the young Georgian firebrand." At only 24 years old, this Tblisi-born pianist has already achieved an exceptional maturity of interpretation and a distinctive artistic approach that make her playing unmistakable. 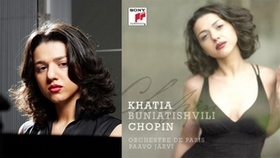 For her second album on Sony Classical, Khatia now releases Chopin. The album encompasses five works superbly showcasing the breadth of her skills as a pianist. Chopin's Sonata No. 2, op. 35, in formal and pianistic terms, is one of the most consummate works of the post-Beethoven period and above all known for its fascinatingly, strangely scurrying finale, which Robert Schumann compared to the mocking smile of a sphinx. The unprecedentedly lavish Ballade No. 4, op. 54 is extremely demanding, both technically and artistically. Waltz No. 2, op. 64, is suffused with Slavic heavyheartedness, while Mazurka No. 4, op. 17 concludes enigmatically, as if with an open question. This Polish folk dance is also the basis for the finale of Chopin's Piano Concerto No. 2. Khatia, who lives in Paris and speaks five languages, made her debut as soloist with orchestra when she was only six years old. Before the age of ten she received her first invitations to play in Germany, the Netherlands, Belgium, Austria, Switzerland, France, Italy, Israel and the United States. Khatia is not only a third prize winner in the 2008 Rubinstein Piano Competition, but also a recipient of the award for the best Chopin interpretation. In 2010, she received the Borletti-Buitoni Trust Award and was included in the BBC New Generation Artists series. Since then, Khatia's career has advanced into a new dimension: she has played with Paavo Järvi and Kent Nagano, among others, and in 2011 opened the Ruhr Piano Festival. In the current season, Khatia is the "rising star" in Vienna at the Musikverein and Konzerthaus. 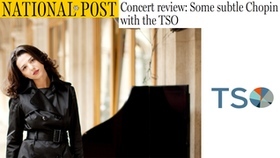 She is performing recitals in Berlin, Vienna, Amsterdam and Paris, as well as at the Wigmore Hall and is a guest at the festivals in Schwetzingen, Lucerne and Verbier. In October, Khatia makes her debut with the Munich Philharmonic and the San Francisco Symphony. 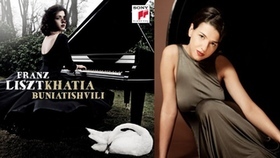 The extremely gifted young Georgian pianist Khatia Buniatishvili is devoting her debut album on Sony Classical, available July 5, to Franz Liszt in celebration of the composer's 200th birthday this fall. Although Buniatishvili sees herself as belonging truly to the 21st century, like the Romantics she looks for greatness in small things and for the universal in the individual. In the music of Liszt, she seeks and finds her idea of musical completeness and pianistic perfection, saying that "only he would enable me to present as a unity the many aspects of my soul." On the recording, Buniatishvili begins with Liszt's third Liebestraum, a story of the intensity and passion of love which is also characterized by the thought from Goethe's Faust: "O stay! Thou art so fair!". The centerpiece of the recording, however, Liszt's Sonata in B Minor, is technically one of the most demanding works ever written for piano. It caused a stir in Liszt's lifetime because of its innovative orchestral treatment of the piano and because it consists of only one movement, encompassing an abundance of characters and types of motion in one single, great span. 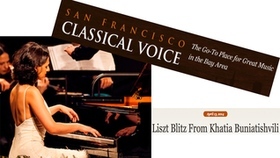 The next piece on the recording is Liszt's first Mephisto Waltz ("The Dance in the Village Tavern"), which was inspired by an episode in Nikolaus Lenau's Faust poem: Amid the demonic dance set off by Mephisto, full of staccato harmonies, lightning scales, and sudden changes of harmony, appears a delicate voice that can be decoded as that of the loving Gretchen. Liszt composed La Lugubre Gondola, which follows, shortly before the death of his son-in-law Richard Wagner, after Liszt had stayed with Wagner in Venice for some time. The work ends with a whole-tone scale and the note G sharp, leading into the key of the last piece on the recording, Liszt's arrangement of Bach's transfiguring Prelude and Fugue in A Minor. Khatia Buniatishvili stands at the outset of a promising career and is regarded as one of the great pianists of the future. Martha Argerich praised her astonishing musical imagination and brilliant virtuosity. Gidon Kremer, who sees her as one of the greatest talents of recent years, chose Buniatishvili as his chamber music partner at venues including the Lockenhaus Festival and the Wiener Musikverein. Born in 1987 in Tbilisi, Khatia Buniatishvili first performed as a soloist with orchestra at the age of just six. At ten she accepted her first invitations to play abroad: in Switzerland, the Netherlands, France, Germany, Belgium, Italy, Austria, Russia, Israel and the USA. 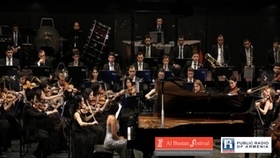 She won a number of awards at the 2008 Arthur Rubinstein International Piano Master Competition in Tel Aviv, including the Audience Favorite Prize, and a year later made her stunning debut at the Klavier-Festival Ruhr, standing in for Hélène Grimaud, who was ill. Buniatishvili played at the opening concert there in May of this year. Khatia Buniatishvili's latest honors and accomplishments include receiving the Borletti-Buitoni Trust Award; recording in the BBC New Generation Artists series; and a nomination by the Musikverein and the Konzerthaus in Vienna as Rising Star for the 2011/12 season. The highlights of her concert schedule this season will be performances at the Verbier Festival, the Lockenhaus Festival, the Menuhin Festival in Gstaad, the Rheingau Musik Festival, and the MDR Musik Sommer. She will also travel to Berlin, Vienna, Amsterdam, Tokyo, Sydney, Barcelona, and London's Wigmore Hall for various recitals. Buniatishvili will make guest appearances with the Orchestre de Paris conducted by Paavo Järvi, the hr-Sinfonieorchester, and the Israel Philharmonic Orchestra conducted by Kent Nagano.